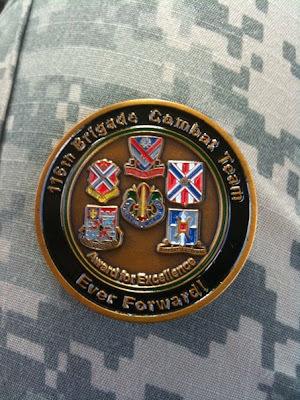 This is the Brigade Commanders Coin (for a very storied unit that includes the famous Bedford Unit. Note the Civil War on the units involvement.... Just don't ask which side of the War of Northern Aggression we were on). 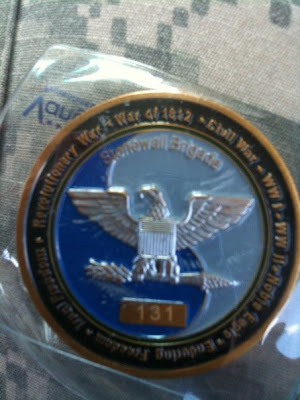 The other 1LT in my unit and I were awarded this by the Colonel. I didn't get many pictures since unfortunately my guys did most of work in a classified annex that they were quite stringent in enforcement of not allowing cell phones (and camera's). I was quite proud of everyone. We had to drive a circuitous route from Hampton to Ft. Indiantown Gap, PA (some 450 miles, all in tactical vehicles like HMMV's (17 just to get my Company's gear up)). Set up quickly and then help everyone else out once we were up. We had 43 people show up and we worked the hell out of everyone. After 2 weeks there we then moved (again by a circuitous route, some 430 miles) to Ft. Pickett VA. We ran a range and then shot on various stuff and then finally back to Hampton, 20 days after we left. For the 2 Platoons that I had I wrote 11 medal awards (all total I think we had 20 award submissions).